Black Cherry Twist in a Royal Sovereign bulldog. Sam Gawith Cob in a 2002 IMP smooth full bend egg shaped meer. MacBaren Three Nuns in a very early Ascorti straight New Dear KS billiard with a carved shank. juice/meds at this desk, DGT '05 CrownAchievement in gourd calabash in smokingroom. Stonehaven in a BSP plateaux rim bent dublin. Having my second bowl of my "daily smoke", some Royal Yacht in a BBB Own Make Virgin st. bulldog I got in Hong Kong back in '70. mmmmm Virginia !! Just finished smoking MacBaren Plum Cake in a 1979 no name French briar smooth full bend egg. Next is Edgeworth Slices in a 1984 medium bend black grain etched Savinelli Non Pareil 9310 poker with a horn ferrule. 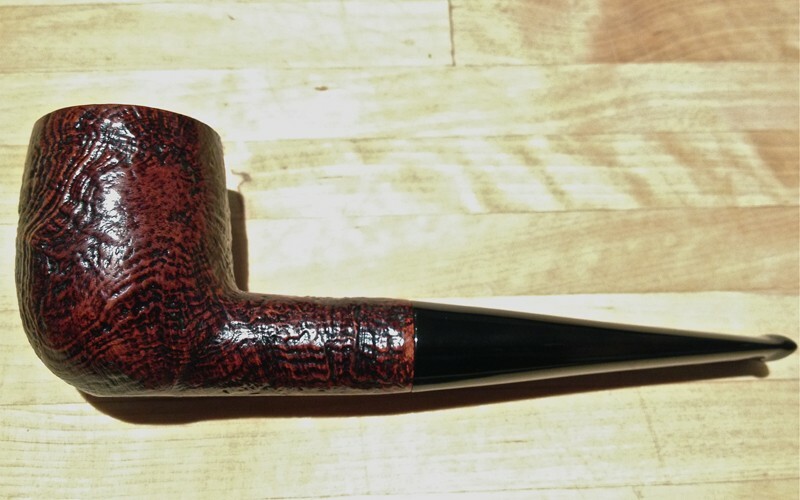 Just finished a bowl of Irish Flake in a Mastro de Paja canted Rhodesian. Now smoking Black Cherry Twist in a Stanwell Nordic sandblasted billiard.